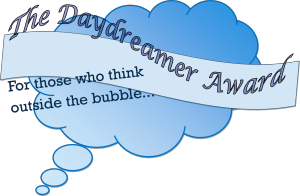 Amanda Richter has nominated me for the Daydreamer Award! I’ve gotten to know Amanda just through other writer-bloggers. I’ve been making a habit of following more writers in the blogging community and ended up meeting fun people along the way. We’re also officially Camp NaNoWriMo 2015 cabin mates. Pshyeah—that’s right. So here’s the rundown of the rest of this post. I like to daydream about my projects. I have so many things to do, that once I have an idea for something to cross stitch, sew, or otherwise create, I get excited about doing those things. The stressful dreams are all the same: I’m either perpetually late for something, or I have a big project/responsibility and I ruin it. I usually interpret it as I’m always wanting to be dependable and helpful. I would be devastated if I let anyone down, especially those close to me. And I just need to chillax so I can get on with the cooler dreams. Publish as many novels as possible. Not sure how many that will be, but one book is the minimum. Be able to travel more. I loved traveling with my family when I was younger and I hope to travel with my future family and show them some awesome corners of the world. Do all the things. As in, I want to get around to doing all these little things that make me happy. But I also don’t want to stress about it if I don’t get them done soon enough. Often I don’t relish the victory of achieving something and instead move on to the next task. Work as an editor for a publishing company. Or own the whole dang thing myself. Whatever comes first. But reading other books and getting paid to do so seems like my kind of life direction. Be a literary agent. I think after collecting years of experience, I would like to help other new writers make it big. I didn’t realize I wanted to be one until I realized I might need one in the future. Everyone else. 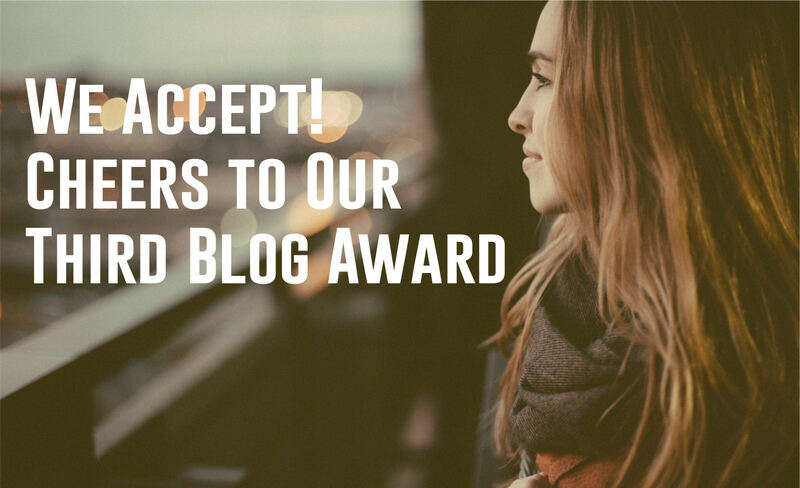 Seriously, if you’re reading to the very end of this post, you’re deserving of a blog award. So accept it and tell me about it! Thanks again to Amanda Richter for the nomination!